Sadly I will be back home from my Barcelona Hen Do trip when this goes live (sob), hopefully tanned and hopefully sober. I wanted to keep the spirit of holiday vibes alive on here whilst I can as I don't know when my next trip will be so here's my Holiday Prep plan (if you're a Virgo you'll understand that these plans are fun!). Before I go on holiday to a new place I always research it via Pinterest. It's such a helpful, visual aid of the place you're visiting and is great for finding secret gems in the area. This is where lists come in handy but as I'm on my Hen Do in Barcelona I'm not making the itinerary so this time I'm passing on that (secretly it bums me out that I'm not organising every day!). After I've researched the place and have an idea of what I want to do, I make a start on packing and making a packing check list, yes, I am that person. I make a start on clothes, shoes, and then tackle the make up and skincare pouches which I find the hardest as I need to narrow the liquids down into the tiniest bag, I only ever take a carry on on small trips. After planning and packing, a couple of days before I leave I start on prepping my body for the warmer weather. This always starts with exfoliating and tanning, always following through with this post on how I prep for bare skin. 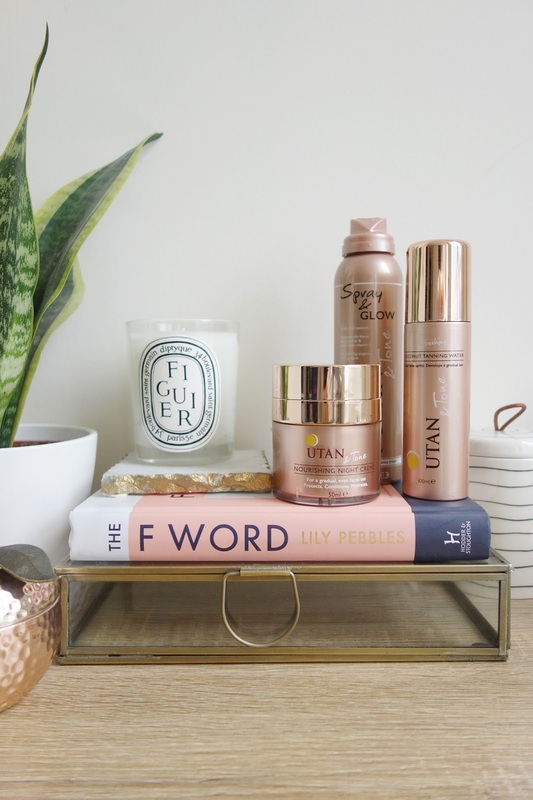 Recently I have been loving this Utan and tone trio which I have been trialling since the start of Spring. I have loved the result of these three together and would highly recommend. After I'm all tanned, next comes nails and toes. I usually like to get my nails done at my nearest Nailista salon and prefer to do an at home pedi, first soaking my feet, then smothering them in lotion and going to town with pretty summery colours. I also like to book myself in for a haircut before I go away, because new hair always makes me feel 10x better so having it for ya hols makes you feel even more fancy. What do you do for your holiday prep?